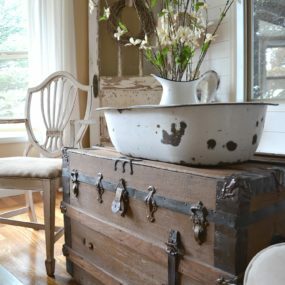 Are you thinking about some new and improved ways to organize and style your house? If so, we have some fun and quirky ideas to peek at. 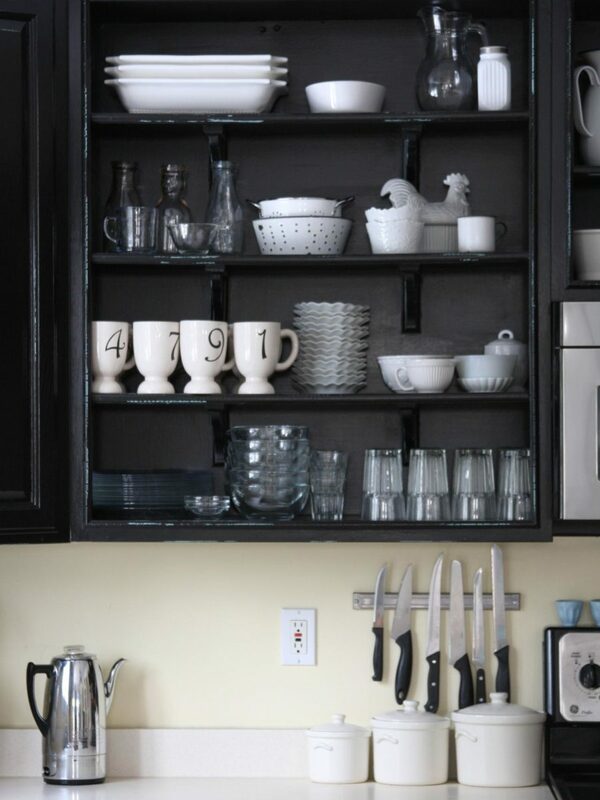 Below, you’ll find 15 open shelving ideas to consider for your home revamp. From the kitchen to the bedroom, you’ll see a bit of inspiration for any nook or cranny of your special place. Just a few wooden shelves can help you out with your transformation. 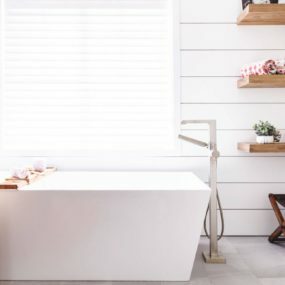 We found this space via Pinterest and we were immediately drawn to not only its simplicity but its unique neutral pairing. The wooden tones and taupes make it both rustically-inspired and modern too. Modish and Main used some open shelving in the home office and we love how it focuses the room. It’s not only used for displaying and organizing, but it becomes art as well. 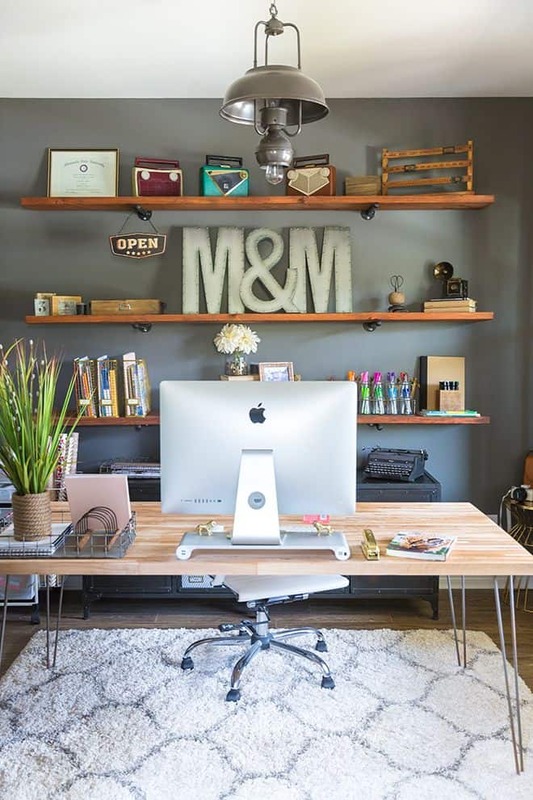 Think about adding something similar if you’re looking for both a trendy and industrial-inspired space to do your work. Another beautiful example of classic and modern open shelving for the kitchen, Beauty and Bedlam showcases it nicely. Not only can you organize your necessities but you can display your favorites and create an artistic vision. Here we have one that’s a bit vintage-inspired. and quite feminine too. Run to Radiance had a open-shelving nook that we were inspired by. It’s like your own little floating coffee bar! We love the wooden and golden hardware design of the actual shelves as well. 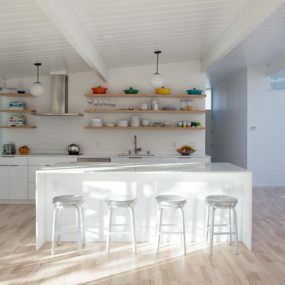 We’re swooning for this kitchen space found on My Domaine. 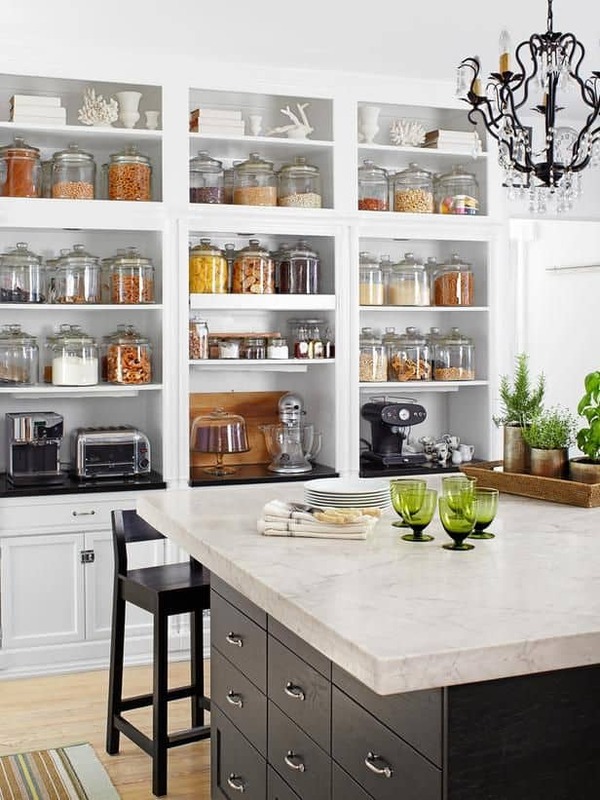 Not only does it give you ample storage and organization ability but we love the jars and how easily accessible everything is. When you can see it, the battle of finding what you need is eliminated. 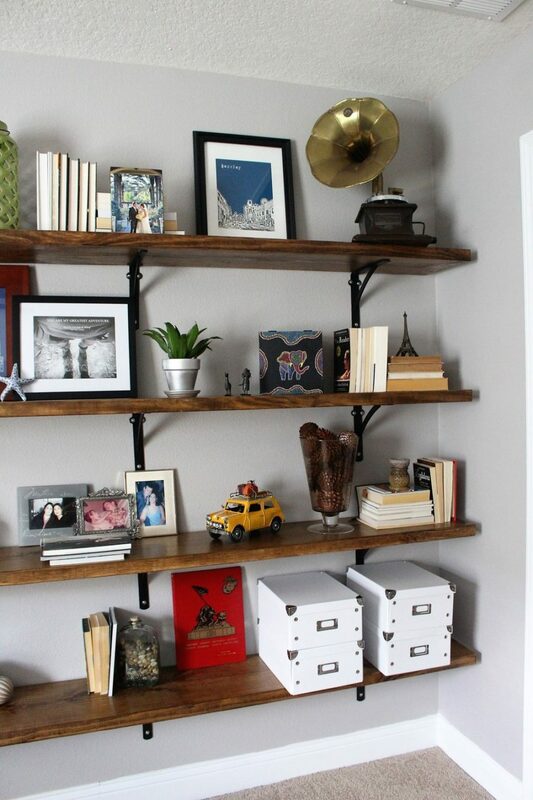 You may want to utilize some corner shelves in any of your rooms as well. And doing it openly is quite nice. 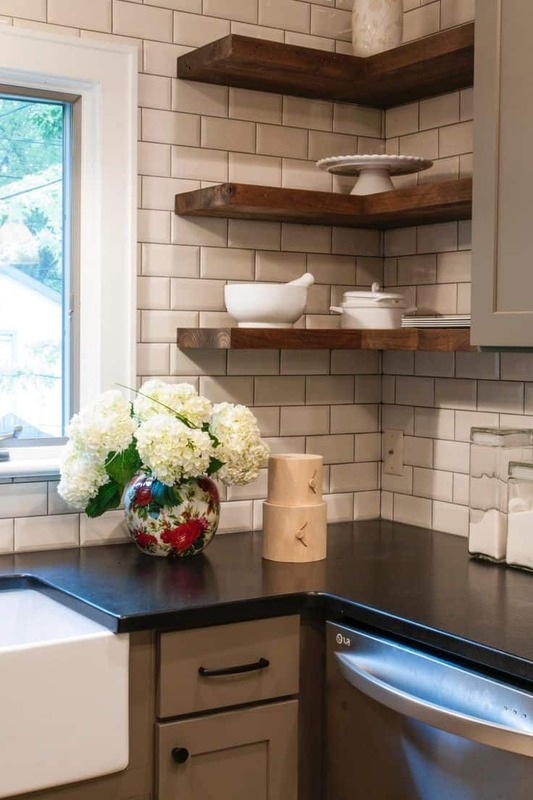 Just take this kitchen peek from HGTV as the perfect example. Use it to display your favorites or have extra places to store. 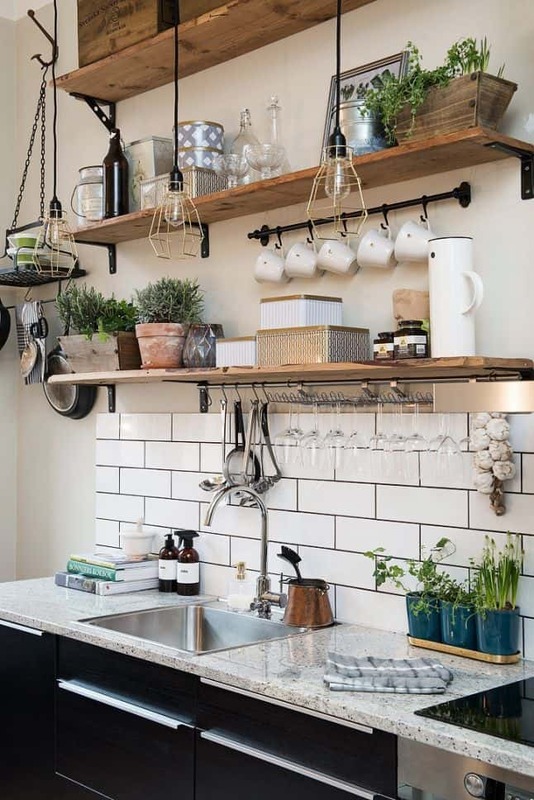 Over at Decoholic, you’ll find a more industrial take on the open-shelving trend. 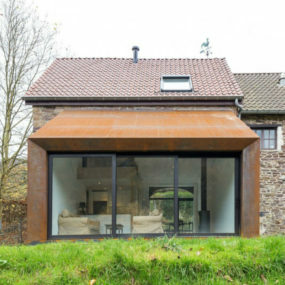 We love it though and the mix of woods and metals. 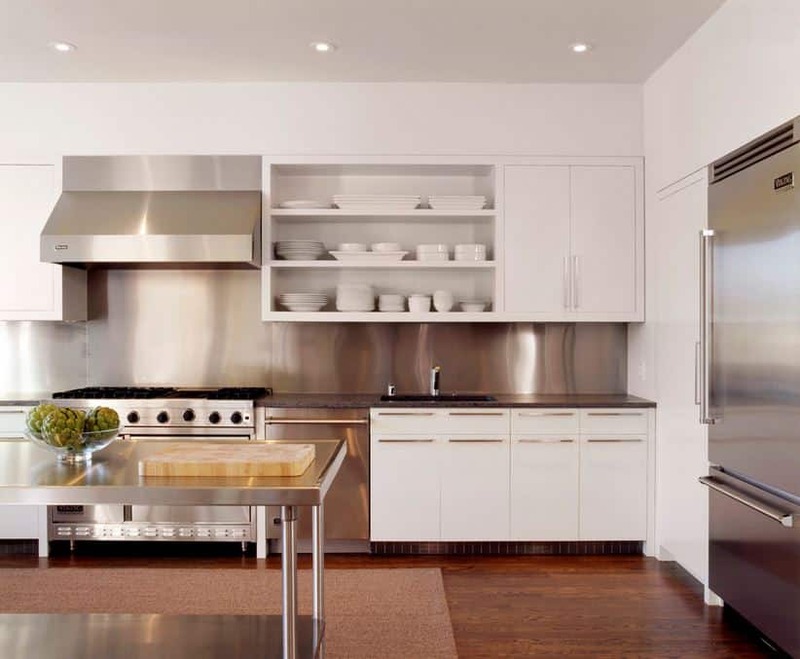 Take your kitchen to the next level – and find what you need faster – by going this route. House By The Preserve had some open-shelving in other rooms – besides the kitchen. And it’s a great example of how it can help organize plenty of other spaces inside the home. 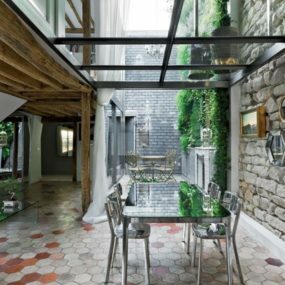 But it does it in a way that added personality too without creating dull, bare spaces. 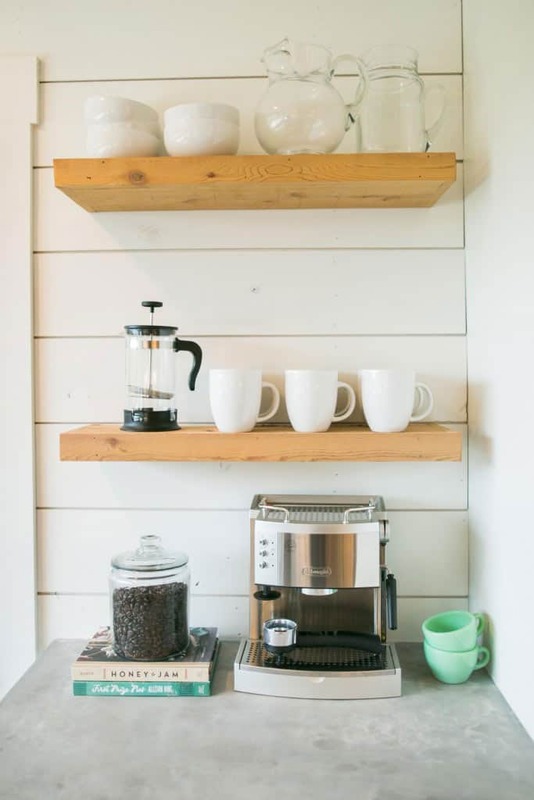 If you’re more of a minimalist, than this coffee nook from The Harper House is exactly what will inspired you. 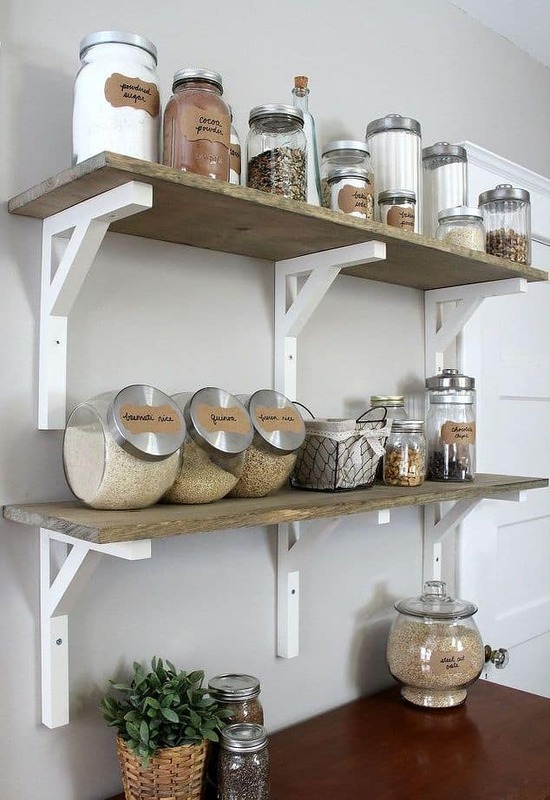 Easy, natural wood shelves and just what you need on each tier, it’s both quaint and charming, don’t you think? Another minimal, no-fuss design can be found over at Decoist. 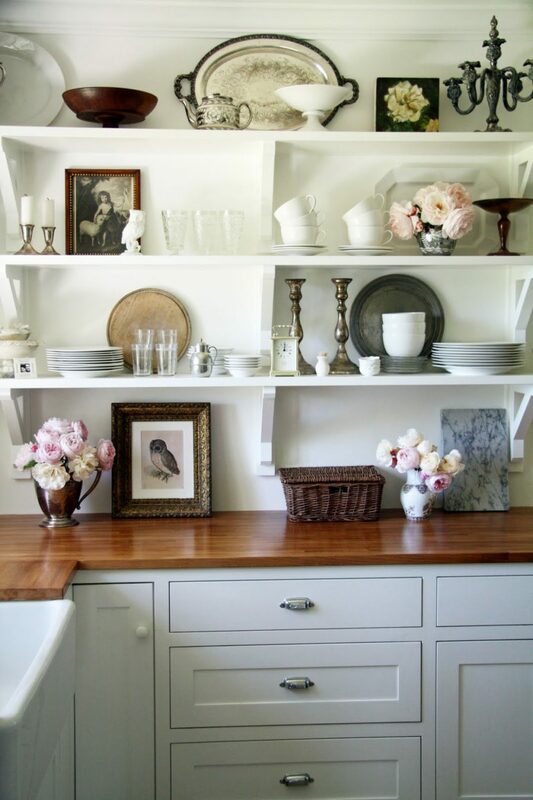 You can go with traditional cabinetry and open shelves as the same time and still get a sharp, finished look. Just peek at this monochromatic, crisp space for example! 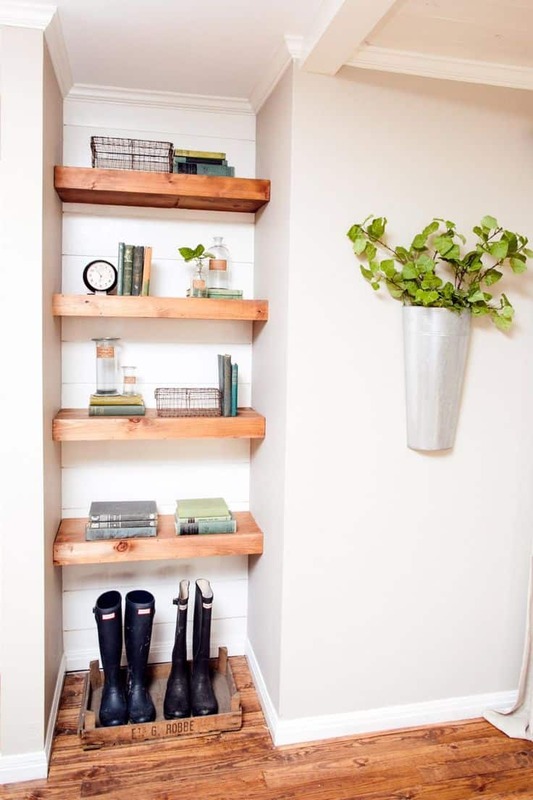 We’re swooning over these built-in shelves in the office too. You can really organize all of your necessities and add some color to your monochromatic room as well. Thanks for the ideas Freshome! Really though, kitchen shelving is always the hardest to maneuver. And Hometalk gives us just another peek into what you can do with any bare corners or breakfast nooks. 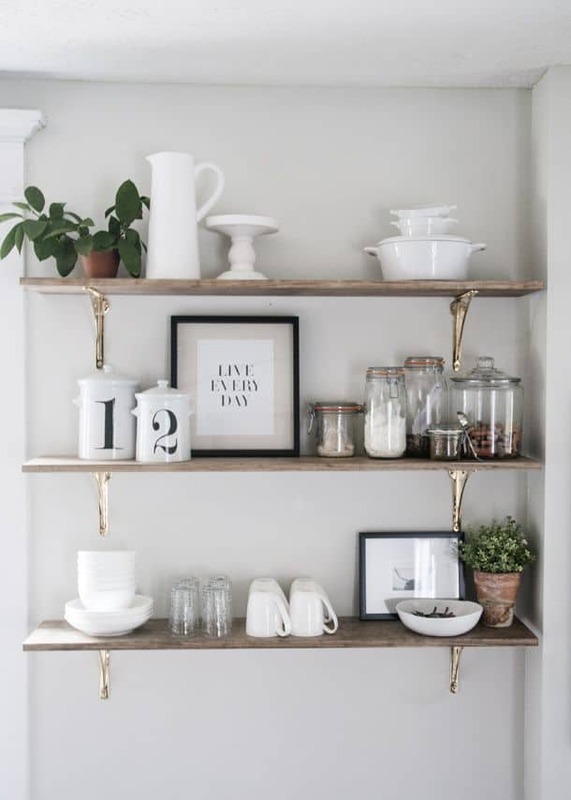 Install some floating shelves and start restyling! 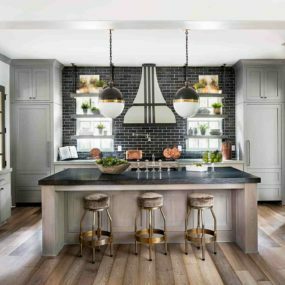 HGTV showcased some black open cabinetry that we’re really loving too. It blends modern and traditional style nicely as well as showcases more ways to utilize the shelving trend. We love being able to see all of the glass dishes too! Pinterest always has great inspiration, as we all know. And when we spotted this living room corner we knew we had to showcase it. 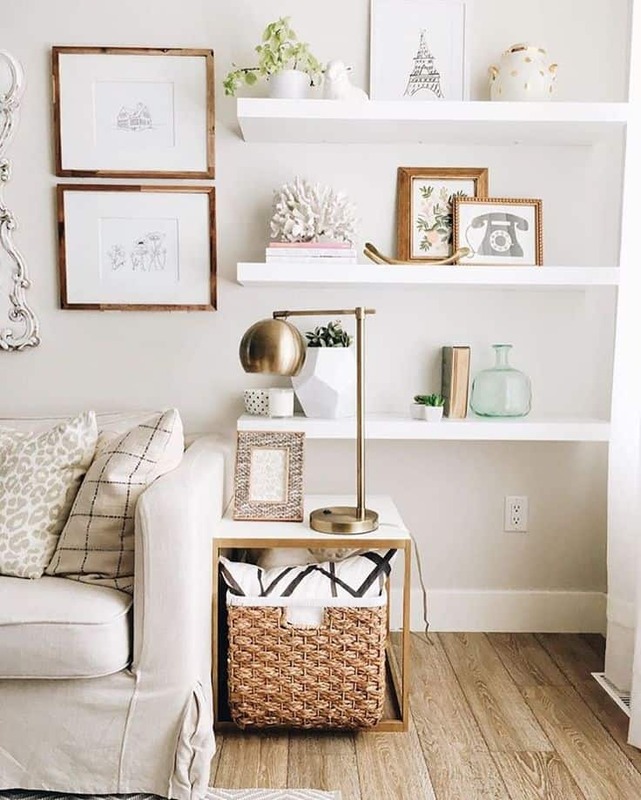 Some open shelving in these kinds of rooms are great too, especially for personalizing and styling! 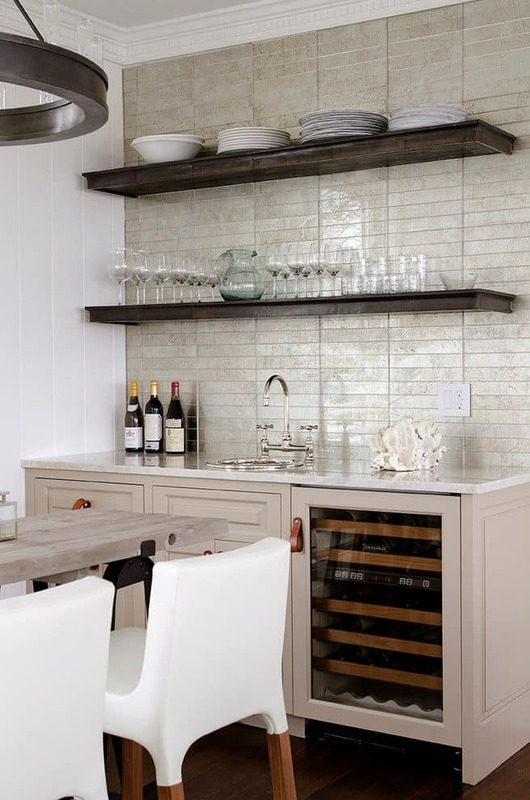 And finally, we love how this space was utilized over at HGTV. 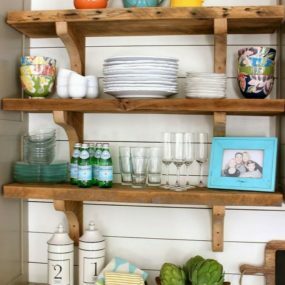 The natural wooden shelves are such a great way to fill in a bare nook and then utilize it! Display and add a bit of your own flavor to an unsuspecting area.